I'm spending Tuesdays this summer pursuing presence by enjoying and celebrating small things and taking to the time to share them with you here. Small things, added together, are what make up a life and chances are, someday, when we look back at our lives we will notice that perhaps those small things weren't so small after all. Simply Tuesday: Small-Moment Living in a Fast-Moving World by Emily P. Freeman - This HAD to be my first choice for this category because it's what inspired me to do this on Tuesdays. I've been enjoying participating in the #itssimplytuesday community on instagram for quite a while, in which, on Tuesdays, we celebrate the extraordinary in the ordinary of Tuesday. I'm finally, slowly and savoringly, reading the book and boy does it echo and affirm all that the Lord is doing in me around slow living and and pursuing presence. 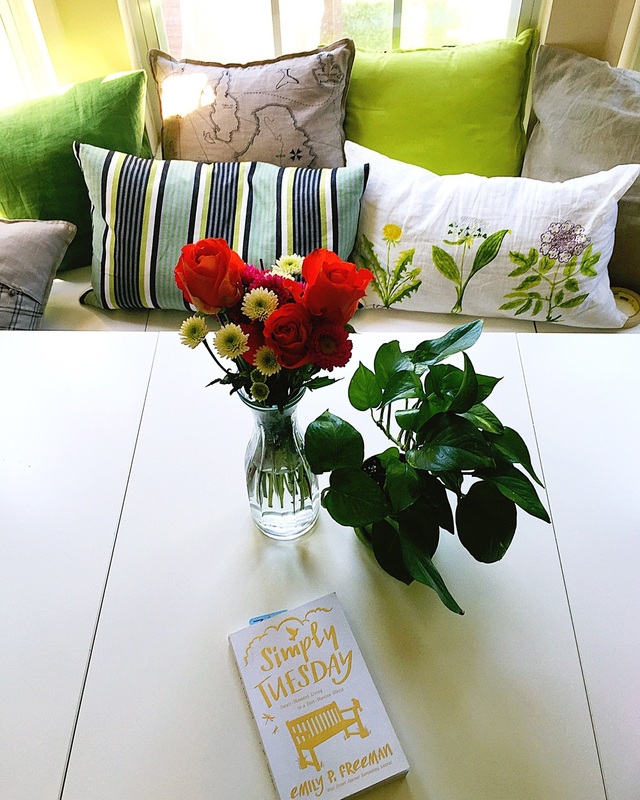 My kitchen table today and "It's Simply Tuesday"
Where the Light Gets In: Losing My Mother Only to Find Her Again by Kimberly Williams-Paisley - I love a good memoir. I like hopping into someone else's life and taking a peak around. I guess that means I'm nosey, but I'd prefer to think of it as curious about and desiring to learn from others. I'm not someone who is super into pop-culture or follows the lives of stars, like at all; but it was kinda fun to get an inside peek of one of the stars of a movie that has been a part of my life (Father of the Bride) and to see her "just like everyone else" human story. Her mother is living with a very rare and severe form of dementia and she shares the journey through that in this honest and relatable book. It also tells some of her love and marriage story with Brad Paisley. (I didn't even know they were married. That's how much I pay attention to these things.) It's super cute, by the way. Hoopla - This is a 2nd app that our local library has available. It does a lot of the same things but in a slightly different format. There is different content available on each, with some overlap. You can check out 10 books/audio books/music albums/etc per month. * Simply Tuesday is available on BOTH of these apps in Nashville (and likely other places). There have been some really beautiful evenings this week, filled with gorgeous sunsets and twinkling fireflies, my son calls them "fire bugs." When the days are hot and I want to stay inside, those treats feel extra sweet. Nashville skies can really be amazing! What about you? What is worthy of a good pause to ENJOY and CELEBRATE today?